The European Summer School on Internet Governance offers annually (end of July) a one week academic course (48 hours). 4th Summer School was on July 25-31, 2010 in Meissen, Germany. The course covers the political, legal, economic, socio-cultural, technological and other dimensions of the governance of the Internet. The course includes also practical oriented lectures covering the management of critical Internet resources as well as the development of the domain name market. Each academic lecture is followed by a Q&A Session. There are smaller more practical oriented workshops, round tables and case presentations as well as students project. Evening events with “Snacks & Wine” are for interactive communication among faculty and fellows. Students will get a “Certificate” for the successful participation in the Summer School. 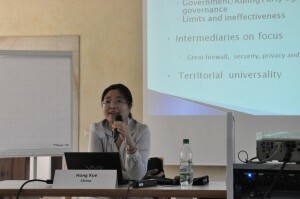 Apart from representatives from the governments of European countries and European Union, a line of distinguished international academic faculties, Prof. Wolfgang Kleinwaechter, Wiiliam Drake, Avri Doria, Hong Xue, Milton Mueller and Wolfgang Benedek gave the lectures on a variety of theoretical issues on Internet governance. Their research reflects remarkable academic quality and international vision. There were also a series of presentations from 5 ccTLD managers, RIPE, UNESCO, geo-TLD applicant and others. Technical community is supportive for the Summer School. Fellows were self-stimulating and highly interested in studying. An International Association of Summer Schools on Internet Governance was initially launched by representatives from Asia, Latin America, Europe and North America. The Nominating Committee (Nom Com) is an independent committee tasked with selecting a majority of the members of the Board of Directors and other key positions within ICANN’s structure. ICANN is an internationally organized, public benefit, non-profit corporation dedicated to: preserving the operational security and stability of the Internet; promoting competition; achieving broad representation of global Internet communities; and supporting the development of policies appropriate to its mission through bottom-up, consensus-based processes. Individuals selected by Nom Com will have a unique opportunity to work with accomplished colleagues from around the globe, address the Internet’s intriguing technical coordination problems and policy development challenges with diverse functional, cultural, and geographic dimensions, and gain valuable insights and experience from working across boundaries of knowledge, responsibility and perspective. Those selected will gain the satisfaction of making a valuable public service contribution towards the continued function and evolution of an essential global resource. Considering the broad public interest, those selected will work to achieve the goals towards which ICANN is dedicated in order to facilitate the Internet’s critically important societal functions.